One of our readers, John Carroll, sent in this amazing project that he’s been spending his evenings and weekends on for the past few years. He is transforming his 5′ crawlspace into a full 8′ basement – removing the subsoil beneath his house one bucket at a time. Ordinarily an excavation process like this is an enormously expensive undertaking. You’ve probably heard of “popping the top” off a house. That’s when a homeowner, often at great expense, lifts the roof from his house and builds a second story into the space between the roof and the first story. Well, when adding a basement, sometimes the entire house needs to be popped. This requires very strong – and expensive – lifting cranes. And you better hope your crane operator had a good night’s sleep beforehand. But John is increasing the head room in his lowest level is the same way the dwarves built the Mines of Moria – digging the walls and floor out, reinforcing underneath, and carrying the excavated earth out by hand. 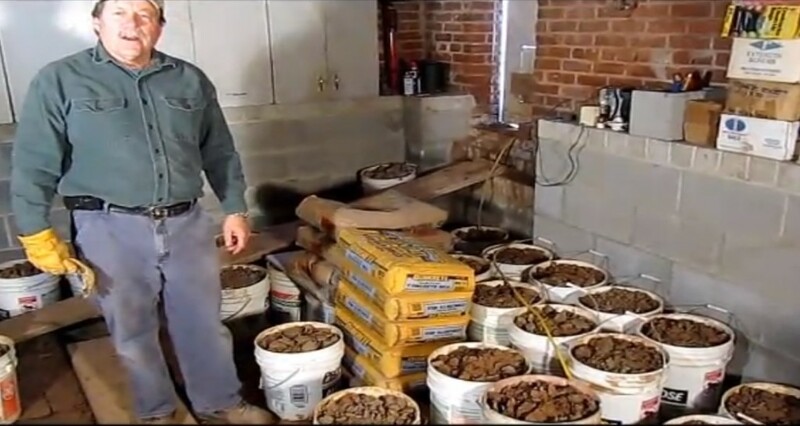 So far John has removed a mind boggling 8,100 buckets of North Carolina soil out from underneath his home. Based on a 40 lb bucket, that’s a staggering 162 tons, carried one bucket at a time. John produced a descriptive video of how his one-man mining mission works and the tools he’s using. Oh dear Lord… Please don’t do this. The weight of the house is on its foundation, and the foundation presses down on the earth beneath it at an angled cone of force. That is, it doesn’t just press straight down. The straight-down force presses the dirt down and out to the sides. The rest of the earth holds it together so the weight is transferred down. By removing half of the cone (the half where the basement is now), you’re subjecting what’s beneath it to a nasty shearing angle. If you don’t do it just right, you can wind up with the foundation and your “supports” leaning and eventually giving way and collapsing. Please be safe in whatever you choose to do. Thank you for your concern. You are correct in stating that the loads imposed on the soil spread out in a angled cone of force. However, all soil is not the same and some soils can resist these loads far better than others. Soil can be composed of sand, loam, boulders and, in fact, solid rock. The soil under my house is very hard and very cohesive clay. Over the last eleven years, it has proven to be very stable as I’ve gradually worked my way around the perimeter of the lower third of my crawlspace. In doing so, I’ve gone under the footing in 4-ft. increments. The load above this 4-ft. section is not great. It consists of the concrete footing and a triangular section of the brick foundation above. In excavating and then rebuilding one four-ft. section at a time, I have completed the lower third (20-ft. by 30-ft.) of my basement–without incident. For the rest of the basement (40-ft by 30-ft.), I am excavating 6-ft. in from the existing footing, which is just outside of the “cone of force” you speak of. As before, I will work in increments. By rebuilding each section before moving on to the next, I’m confident that I’ll avoid the catastrophic failure that you envision.